The colors of Autumn ornamented the hillsides as seven intrepid atlatl hunters came into a wide open expanse of short grasses and tall goldenrod. The forest on either side of the field sheltered the fallow deer which were our quarry. On our mind was one in particular that Doug had hit earlier with an atlatl dart. The task at hand was to find the deer which was last seen a quarter mile away with the dart in its back. We fanned out to try to find either the deer or the dart which would give us a starting point from which to track it. Fallow deer can run like the wind and traverse a hundred yards in about 5 seconds when they are alarmed. We had no idea where Doug’s deer ran other than a general direction.. It was by good luck and perseverance that we managed to find the dart near the edge of the field. finding that deer soon. The shaft had only penetrated the depth of the 2 inch stone point that was now missing. I looked at the other stone pointed dart that Doug had and noticed that it was not particularly sharp and its hafting had been loosened by the rigors of the hunt. If the other one was like that, the deer would live to see an other day. I guess this was the deer’s lucky dart also. Never the less we needed to find out for sure what happened to that deer because it is the responsibility of any hunter to do so. Doug said it was a long shot perhaps 40 or 50 yards or more. But the dart only weighed 3 1/2 ounces. For several hours we observed the herd to see if we could locate the deer. On two or three occasions we managed to see a deer with a small patch of dried blood on its side. The dart point was apparently lodged in the meaty part of the loin above the ribcage. This is kind of wound is far from fatal and this deer would heal eventually. We were just about finished with the hunt and about to go home when a line of fallow does came toward me at full speed trying desperately to avoid myself and Doug who was about 400 feet away. They chose a path exactly half the distance between us. I knew the lead doe’s path will be followed faithfully by the remaining herd no matter what else happens so I quickly closed the distance between me and the line until I was just within range and cast a dart at a high angle and as hard as I could, leading the deer I hoped to hit by thirty yards. The shot, although very long, felt good as I watched the deer and dart converge 55 yards distant. I am sure that Doug had experienced such a scene earlier that day. The dart severed both jugglers in the neck and the deer went down seconds after it got into the woods. Some would say it was a lucky shot, and so it was if you believe in such things. If you were to calculate the odds of whether a person would hit such a distant target moving at such a speed, the chances would be so small that it would be better to buy a lottery ticket. I have taken these long shots several times before and made them! I have also seen other people do the same. There is something working here that seems to be in the realm of the supernatural, but its not. This phenomenon is something that we as human beings share that is just a small step past primal instinct on the evolutionary scale, which I believe has in part, led to our success as a species. Its not a mental skill that you can turn on or off,like the ability to do massive chess calculations or planing a camping trip to the Grand Canyon, but it is something that is very likely to happen if you let it. Its the stage to which the Japanese martial artist aspires, except with atlatl and darts instead of a yumi. Doug’s shot was also just such a long one but unfortunately his dart was too light and possibly not sharp enough or fastened to the shaft well enough to deliver a killing hit to the vitals of the deer. 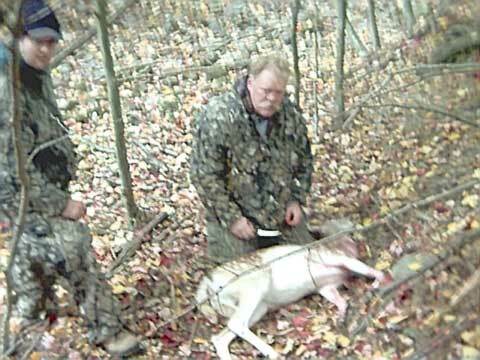 The failure to kill the deer had to do with gear rather than skill. Doug would surely have been a successful hunter if he were hunting every day for a living as his ancestors did on the plains of Eastern Europe ten thousand years ago. As far as I’m concerned he was as successful a hunter as I on this particular hunt because he actually hit a fallow deer, which we have found out is not an easy thing to do. Doug is the only one that I know of in the world other than myself who has hit one of these elusive animals with an atlatl dart. I gave the meat to Doug and Lori because they are in fact King and Queen Mother of the meat rack. Besides, Doug needs the protein to help him develop more of that super primal instinct.